"Hesston Corporation growth made employment of secuirty police necessary. Burns detective agency supplied that service. City growth made a full-time city policeman and radio dispatcher desireable. Hesston Corporation allowed use of its radio facilities and the city contracted with the Burns agency for a policeman. 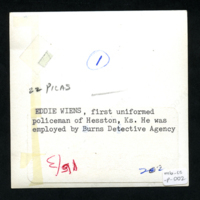 Eddie Wiens took reponsibility for city security. Wiens lived in Inman and the city council wanted a retired policeman. The city hired Alva "Al" Pitts from Valley Center as "Chief of Police" with Wiens as officer" (Bandy, 74). Bandy, Murray C., "Hesston Centennial 1886-1896", pg. 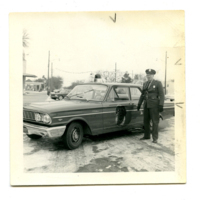 134.
unknown, “Eddie Wiens, first uniformed policeman of Hesston,” Hesston Public Library, accessed April 19, 2019, https://hesston.digitalsckls.info/item/1355.